The scientific objective of the study was to identify consumption patterns in one-person households of never- married women and men, living independently. Ward’s grouping method make possible to establish the number of households’ clusters. The final stage of household grouping procedure, regarding consumption expenditures was accomplished with k-means clustering method. 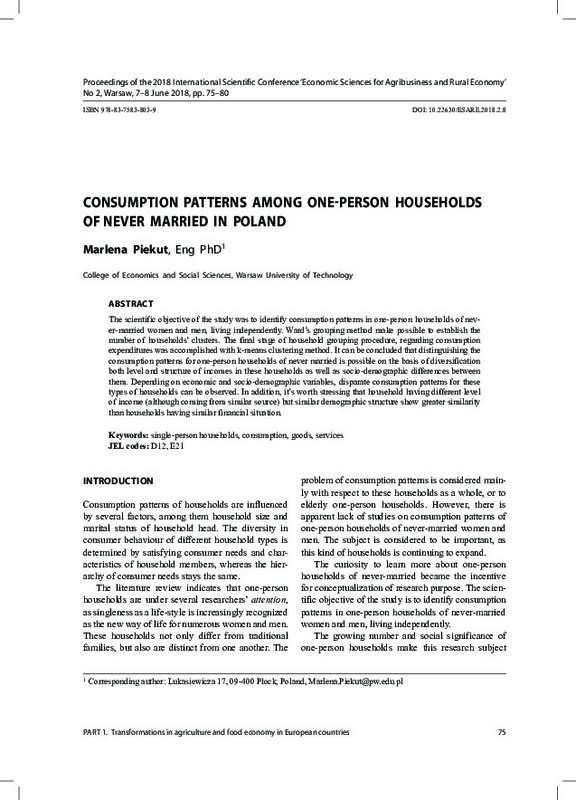 It can be concluded that distinguishing the consumption patterns for one-person households of never married is possible on the basis of diversification both level and structure of incomes in these households as well as socio-demographic differences between them. Depending on economic and socio-demographic variables, disparate consumption patterns for these types of households can be observed. In addition, it’s worth stressing that household having different level of income (although coming from similar source) but similar demographic structure show greater similarity than households having similar financial situation.